Sacramentum Vitae: Independence, but from what? Unfortunately, I find myself forced to agree with The Gonzman, though as a once-and-future academic I couldn't get away with putting things as he does. And considering the news constantly tracked by AFA, it's even timelier for today to repost, in slightly revised form, what I said one year ago. 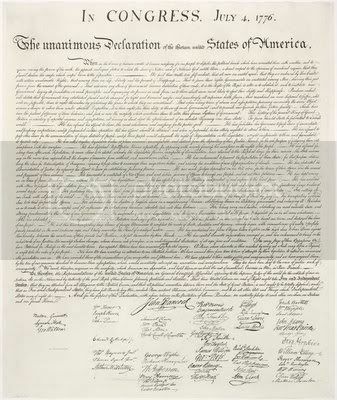 On this day in 1776, the Founding Fathers signed a Declaration of Independence containing the following statement: "We hold these truths to be self-evident, that all men are created equal, that they are endowed by their Creator with certain unalienable rights, that among these are life, liberty and the pursuit of happiness." On that basis, it was said that "the laws of nature and of nature's God" impelled them to "separation," thus forming the basis of the new republic. Thus, to those who so boldly risked their "lives, fortunes, and sacred honor" to found said republic, it was actually "self-evident" that there is a Creator who is also a Lawgiver! Such is the religious and moral foundation of the United States, whatever the other religious and philosophical differences among the Founders may have been. These matters, involving the most intimate and personal choices a person may make in a lifetime, choices central to personal dignity and autonomy, are central to the liberty protected by the Fourteenth Amendment. At the heart of liberty is the right to define one’s own concept of existence, of meaning, of the universe, and of the mystery of human life. Beliefs about these matters could not define the attributes of personhood were they formed under compulsion of the State. What's the upshot? It is now a premise of constitutional law that government may no longer embody in positive law any "concept of existence, of meaning, of the universe"—i.e. any religion or philosophy—that leads, logically, to forbidding "intimate and personal choices" embodying a different concept. What the signers of the Declaration took to be the universal basis of natural rights is now viewed as a violation of such a right when applied in positive law to the most basic issues of human life. The result: the holocaust of abortion continues and the absurdity of gay marriage begins its encroachment. The horror and filth is all around us. I pray that the new, Catholic members of the Supreme Court help to start turning all that around. Mary Immaculate, Patron of the Americas, pray that God's mercy change us. Why "the Rodney Dangerfield economy"? Is Anselm's "ontological" argument ontological?